The erstwhile "Ockhi" has almost dissipated and with a "bald" centre, is located at 19.1 N and 71.5E. Massive dry air encirclement and cold waters almost decayed the system within 12-18 hrs.Difficult without cloud imagery to get exact core pressure and wind speeds, but approximately average pressure should be 993 mb and 30-40 kmph winds. As expected much earlier by Vagaries, dry air encirclement and cold waters with wind shear almost finished off the system. Dry day tomorrow for Gujarat and North Konkan. Day Temperatures rising in Gujarat. Mumbai: The maximum rain spell is over. With not much rain now, Wednesday will be devoid of rains, and in fact bright. Today, Scruz recorded 36 mms in the same 12 hrs period of time. Scruz also breaks its own December record which was 55.7 in 1967 and heaviest fall was 31.4 mms on 12 Dec 1967. Total this year in December is 58 mms till 8.30 pm 5th Dec. Maximum temperatures on 5th December: Colaba 23.2c and Scruz 23.3c. Mumbai: Heavy rains currently lashing Mumbai. As the depleted storm moves past and skirts Mumbai, 5.30 am at 18N and 70.6E, just about 250-260 kms west/South West off Mumbai.Estimated pressure 990 mb at core. But the main convection area is now around Mumbai, East of the centre. 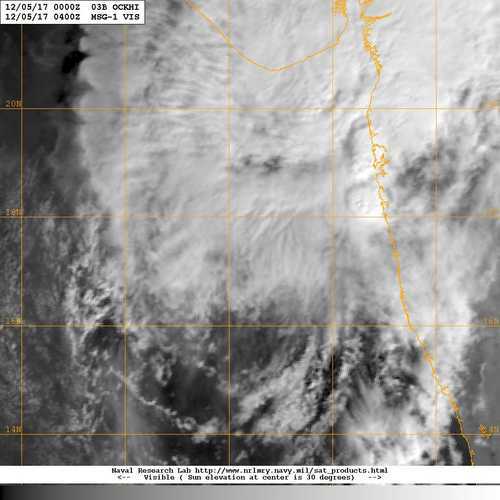 And apparently the Centre, seen thru convection clouds as they weaken just 200-220 kms West off Mumbai. Extra thick and convection clouds seen around and on Mumbai .Image of 9.30 am. Mumbai rainfall expected to decrease substantially post noon or evening. Mumbai Pune highway - heaven on earth -> dense forest,trees,hills/valleys,tunnels, waterfalls everywhere back in action! -> zero visibility. BBC says heavy rains for Mumbai- bay is starting another low-> AS low will slam into GUJ/MAHA and with Bay low will this form a lethal combination? GUJ 2017 JUL / AUG floods? Navi Mumbai raining since yesterday. Thanks Rajesh for your crisp but detailed updates through this surprise "NEM" monsoon in Mumbai. Kept us well informed of what to expect of some unusual weather conditions. Maximum temp is very low, but when will minimum temp drop in Mumbai to the 'typical winter night temperatures'? 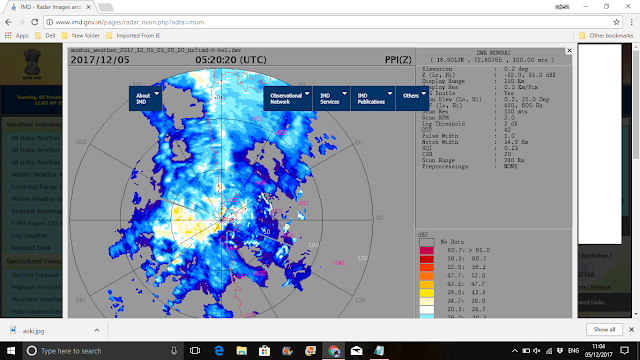 Next WD seems to be strong enough to give rains in northern plains.Rain is necessity in Delhi now.Since formation of OCKHI AQI is severe to hazardous. Your thoughts on WD. Prediction was around 30-40mm total rains for Mumbai. South Mumbai got over 100mm rains. Ockhi gave more rains to Mumbai than Gujarat. sir wasn't it surprising south mumbai got more rains than north (western suburbs) ? Rajesh sir,it rained intermittently entire night in Nagothane and till 10am today rainfall continued. For people, who says TN got less rains this year. Only 2-3 stations got 10% less rains in whole 2017. Where as many station got more than 10%. North East Monsoon monsoon on its own too has been fairly good. Percentage Deviation in rainfall from 1st October to 6th December. So other than Coastal AP, it has been pretty good in all other subdivisions. The season is not over yet. The next bay low is expected to bring good rains to Coastal AP so that deficit will come down too. People are also talking about Gujarat receiving a lot of rain in the October to December(To Date) period. Yes that is negative 52 percent. All numbers are from IMD web site. Any one can verify. Mr. Joshi, People's minds are made up so let us not confuse them with facts.